Guides: saw alignment, maintenance, safety -2º to 47º 18" / 8.5" 52 lbs. / 14 lbs. When it comes to portable table saws, it can sometimes be a challenge to find one that is lightweight but sturdy. The Bosch GTS1031 10-inch portable jobsite saw advertises itself as being both lightweight and sturdy, but do the facts live up to the claims? 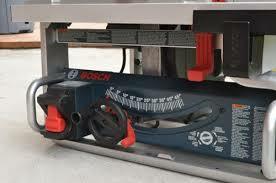 Read on to see our take on Bosch’s offering in portable jobsite table saws. Unbox everything, and you’re almost ready to cut. Just a few minutes of assembly, and you’ll be rolling along. The Bosch GTS1031 comes almost fully assembled out of the box, so it took only 5 or 10 minutes to have my saw up and running. The optional GTA500 stand takes a few extra minutes to assemble, but the saw attaches to it quickly in a matter of seconds. The accessories attach quickly without the need for tools; they just snap into place. Please note that this saw does not have to be used with a stand; its design is done so that you can just set the saw on a workbench and use it that way. With that said, I found it much easier to work with the saw attached to the stand, so I’d recommend at least considering the extra purchase. When I checked the alignment and fine-tuning on this table saw, I found that for once, the manufacturer claims were accurate—the saw was perfectly aligned right out of the box, so I did not have to do any fine-tuning of the saw. The GTS1031 sports a 15-amp motor, so it is capable of cutting through hardwoods with ease. Depth of cut at a 90-degree angle is 3-1/8”, and you can cut up to 2-1/4” at a 45-degree angle. The all-steel base design of this table saw keeps the saw lightweight, but also allows it to stack on its side for transport and storage. It can also handle some jobsite abuse without worries. The Squarelock rip fence locks into channels on either side of the table saw for solid and consistent cutting performance, and requires no adjustment or alignment to keep it truly square. The GTS1031 features a carrying handle that is designed to carry the saw one-handed, and it works pretty well. The saw weighs 52 pounds, though, so even though the saw is well-balanced and easy to carry, it is a bit awkward to carry it one-handed. One very nice thing about the Bosch GTS1031 is the storage space under the saw. 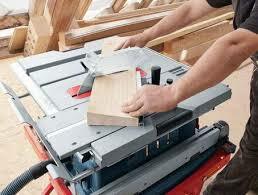 Every accessory that comes with the saw, even the rip fence, can be stowed away in its own secure slot under the saw. This makes storage and transportation a cinch, and you don’t have to worry about losing the pieces and parts to your saw. 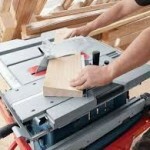 The only drawback to this table saw is its small size; the saw can only rip up to 18” widths, so you’ll be hard pressed if you have larger sheets of plywood that you need to work with. The all-steel design of this table saw’s frame makes it a tough nut to crack, and believe me…I tried! Several drops and falls later, the saw remained accurate and true, and there were no ill effects on the saw’s performance. This is truly a portable table saw for the job site, since it will stand up to some abuse without affecting its performance. This is definitely a contractor’s jobsite table saw! The Bosch GTS1031 is very easy to set up and use, requiring just a few minutes to install the rip fence and raise the riving knife. The bevel and blade height adjustment knobs are easy to use, and the rip fence moves smoothly across the table once it is unlocked. Unlocking the fence requires a bit of hand muscle, but I was able to manage it quite nicely. 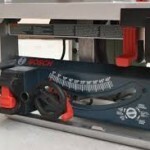 The expandable tabletop makes it easy to cut widths of up to 18 inches, pulling out in seconds to allow you the extra room you need to cut your wood. The miter gauge works flawlessly, which is a nice surprise for a portable table saw. I’m used to having to either fuss with the miter gauge to get it accurate, or replace it with a third-party miter gauge. The miter gauge on Bosch’s GTS1031 is basically perfect, and works wonderfully. I’ll mention again the nice feature of having accessory storage right under the base. Even the push stick has its own storage slot, so you can enjoy having all of the pieces you need right there when you need them. Bosch provides a 1-year warranty on the GTS1031, and their customer service has one of the highest reputations in the industry. In the event that you do run into problems with the GTS1031, rest assured that Bosch will make it right, right away. If you’re in the market for a top-quality portable table saw that won’t break the bank, the Bosch GTS1031 is definitely a top contender. Its compact design, easy storage of accessories, and well-thought handle design make this a beauty to both transport and use. 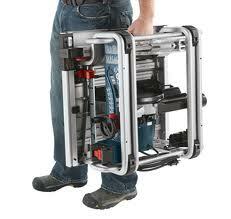 It performs flawlessly even after a bit of abuse, which is important for a jobsite saw. This is a table saw I can stand behind and strongly recommend. Check Amazon.com’s price on the Bosch GTS1031 if you want to make a purchase. This saw is unsafe. The riving knife knob that keeps it secure is cheap plastic and wont stay in place. During use the knob came loose and the riving blade hit the saw blade and showered with sparks causing injury. No way to ensure the knob stays locked in place.